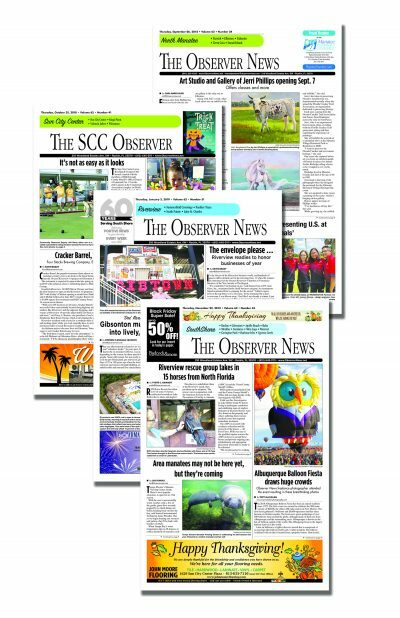 No newspaper in South Hillsborough has the reach of The Observer News and The SCC Observer! To advertise with us, email one of our friendly sales associates or call 813-645-3111. If your display ad requires a proof it must be submitted by Thursday at 12:00 p.m. and be a minimum of 8 column inches. For information on advertising costs, click here to download a current rate card, or contact your sales representative for more information. E-mail Press Releases to news@observernews.net. Deadline is Thursday, 4:00 p.m., for the upcoming issue. To read and download our press release guidelines and letters policies, click here. Classified Ads up to 20 words are $17 with $0.30 for each additional word. Deadline is Monday at 4 p.m. To place your ad, email Alex at alex@observernews.net or call 813-645-3111. Obituary rates are $10 per column inch. $15 to insert a photo and $5 to insert a U.S. Flag, military or fraternal insignia or religious graphic. Email to news@observernews.net , or call 813-645-3111.